We are the official Western Australian supporter group for The Carlton Football Club. We were established by Carlton in 1992. We regularly get together at Empire in Perth to watch live games of the mighty Blues. We as a committee also help Carlton with pre and post-match functions when Carlton travel to Perth. The CFC WA Member Network Committee is made up of 10 dedicated local Blues members. 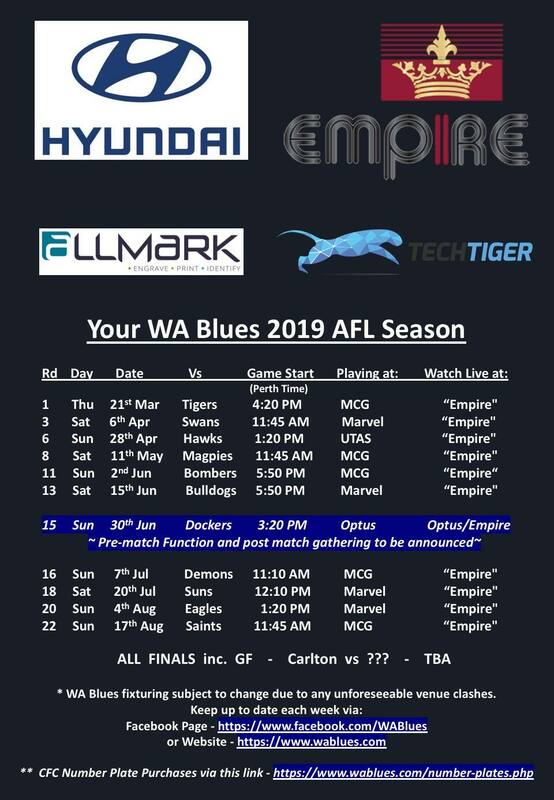 You will find most of us down at Empire whenever we hold a local function and doing whatever is requested by Carlton at all the pre-match or post-match functions when the Blue Men’s and Women’s team travel to Perth. Home Supporter Base: “Empire" 220 Great Eastern Highway, Lathlain, 6100. There is no membership fee. The WA Blues exist as a non-for-profit organisation to provide a social and family friendly support group and home for WA based supporters to enjoy live televised games together.